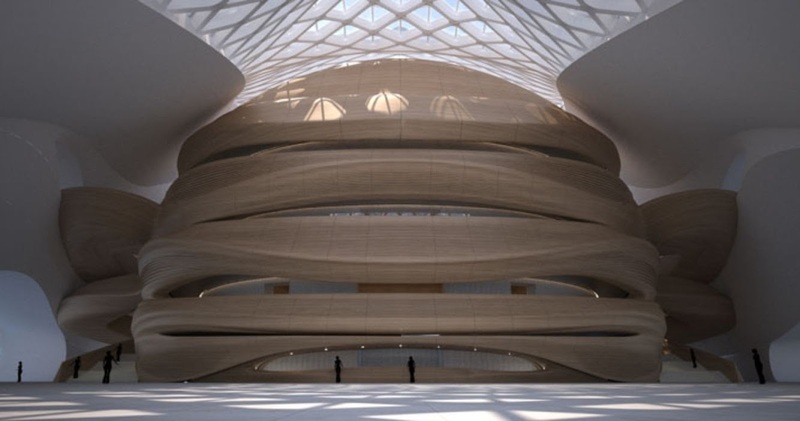 In February 2010, Mad won the competition to design the cultural center of Harbin. 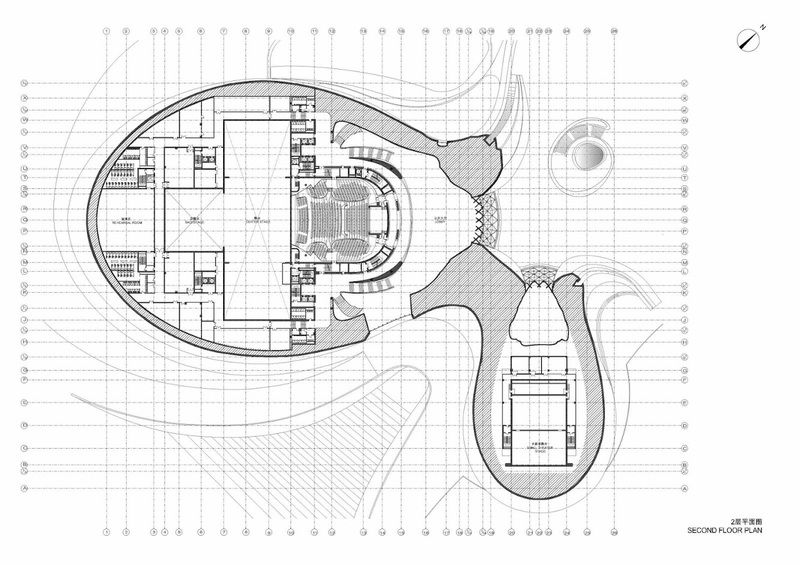 the entire project covers an area of 1.8 square kilometers, with a construction area of 79,000 square meters. in August 2013, the overall structure of the Cultural Center was completed and the entire project began to take shape. 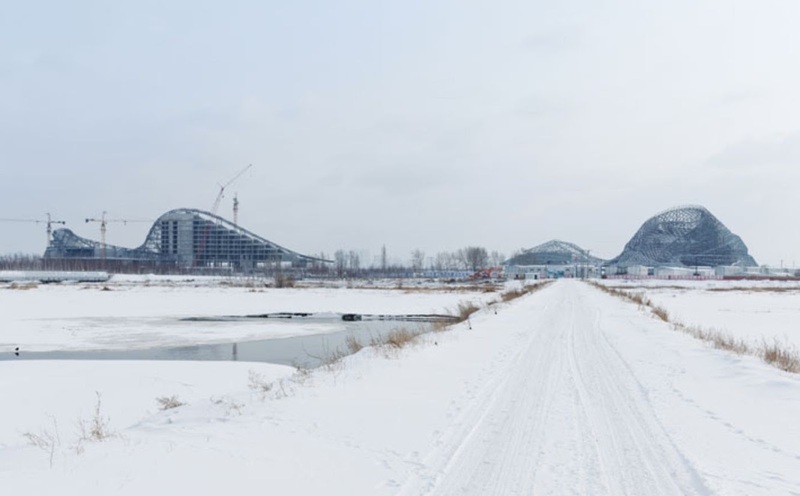 the entire building is expected to be completed in 2014 when the Harbin July summer concert will be held. It is part of the development north of Sun Island, which is an important natural habitat in the north. Influenced by both Chinese and Russian culture, Harbin is reputed as the music capital of the north. 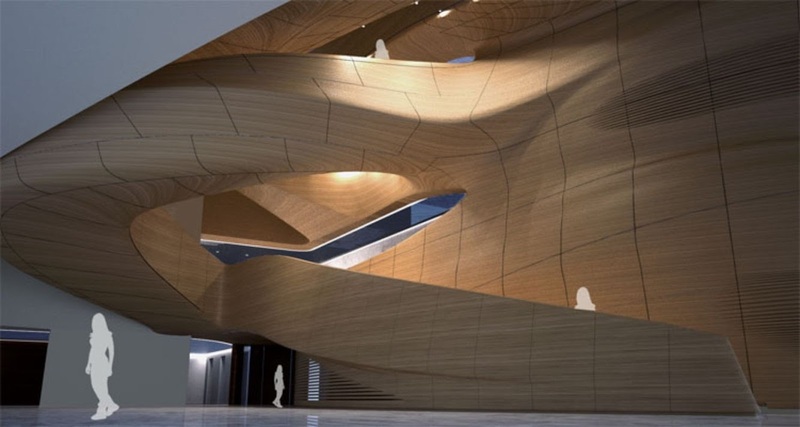 Different from other theater buildings that are normally located in the urban center, Harbin Grand Theater will not act as an isolated landmark for the city, but the natural continuation of the human spirit. 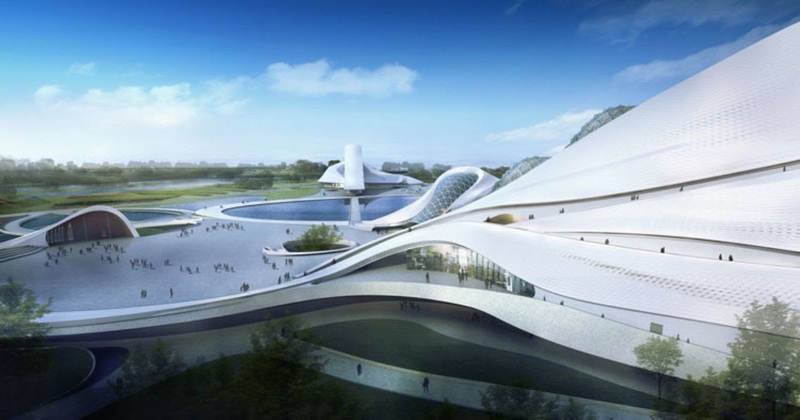 Apart from regional protection and utilization of the wetland ecosystem, Harbin Theater, Harbin Labor Recreation Center, Harbin Great Square and the Wetland Park together compose the Harbin Cultural Island, to join culture, art and nature in an integrated environment. Surrounded by rivers, the Cultural Island embraces the wide riverbank as its background appearing as a glacier stretching and connecting to each other into a cohesive whole. 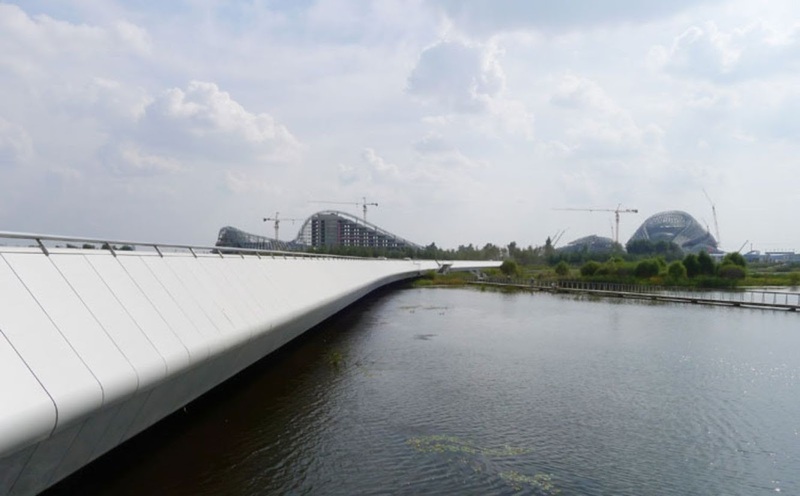 the main entrance mimics a jade belt bridge spanning the wetlands and connecting the city and the cultural center together. 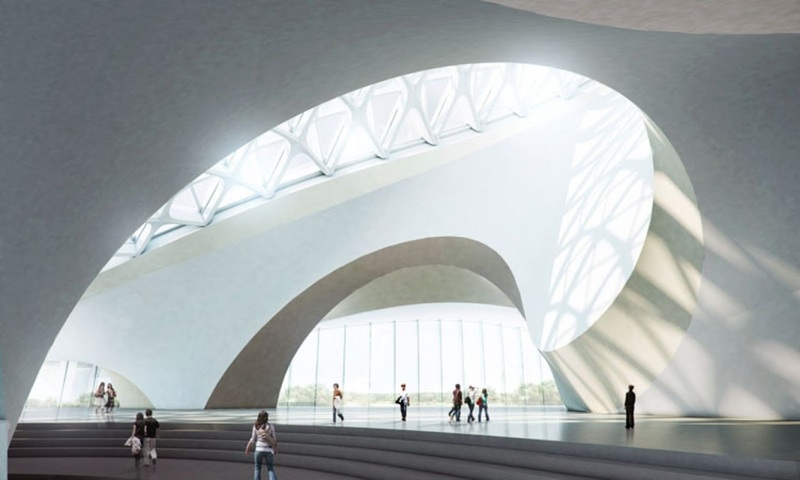 the movement of the terrain strategically directs the flow of people from different directions to the entrance of Harbin Theater and Harbin Labor Recreation Center. the external ramp of the Grand Theater, resembling a mountain path formed by gusting winds, guides people from the interior to the exterior. Walking along the landscape passage, visitors are able to appreciate the surrounding cultural and natural landscape. Atop the highest point of these buildings, visitors are able to enjoy a panoramic view of the surrounding scenery as if they are on top of a mountain. the grand theatre takes the natural beauty of the north as its premise. 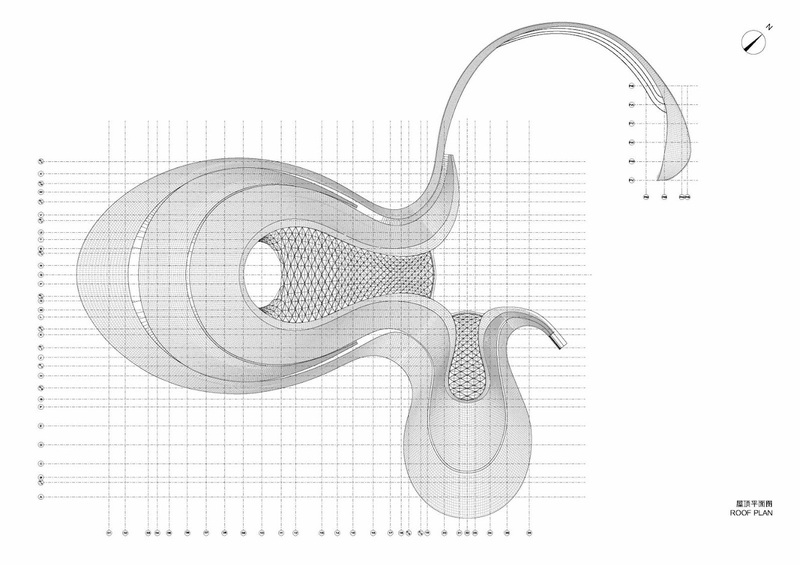 in an attempt to reduce such a large volume, the architectural form is a continuation of the natural environment as it becomes part of the landscape. 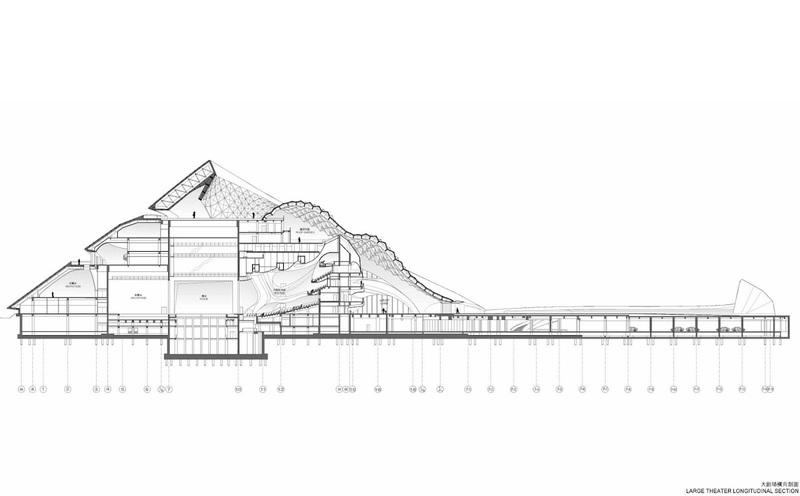 the entire building acts as an undulating snow covered mountain, following a natural rhythm. 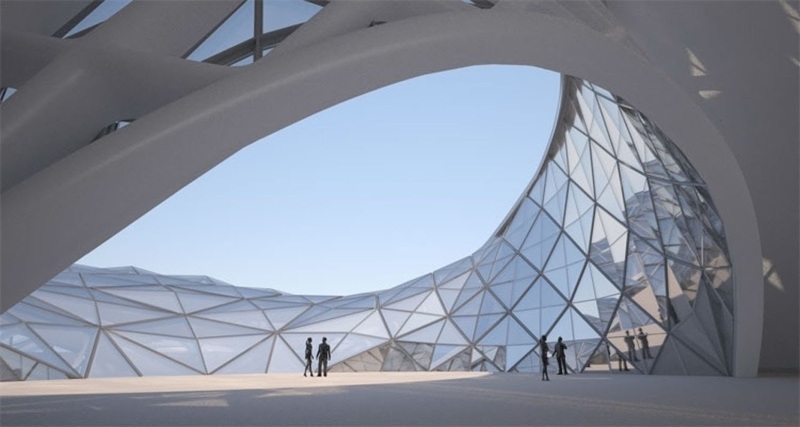 The cladding of the building is custom-made pure white aluminum. White stone and concrete are also used as part of the wall, introducing a pure feeling as ice and snow. the skylight above of the auditorium utilizes natural daylight. During the day, the need for interior lighting can be completely satisfied with energy-saving and special lighting effects. the Grand Theater is made up of two different sized theaters. 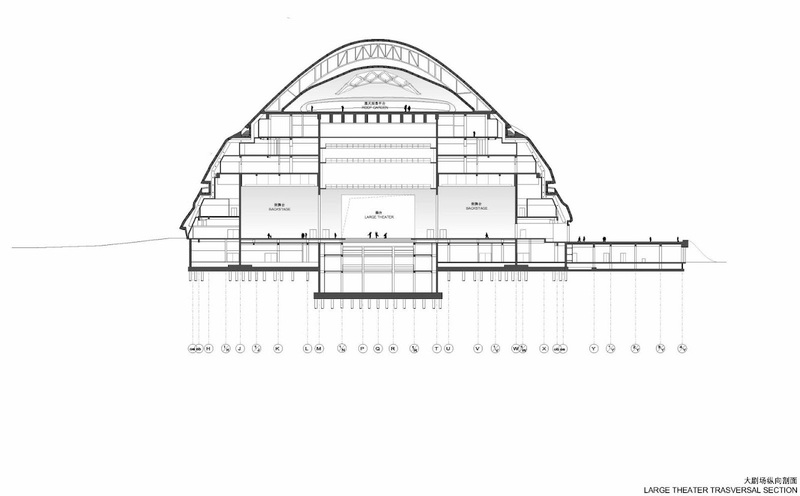 the larger theater can accommodate up to 1,600 guests and it is formed with lower level stalls and a two-floor gallery. 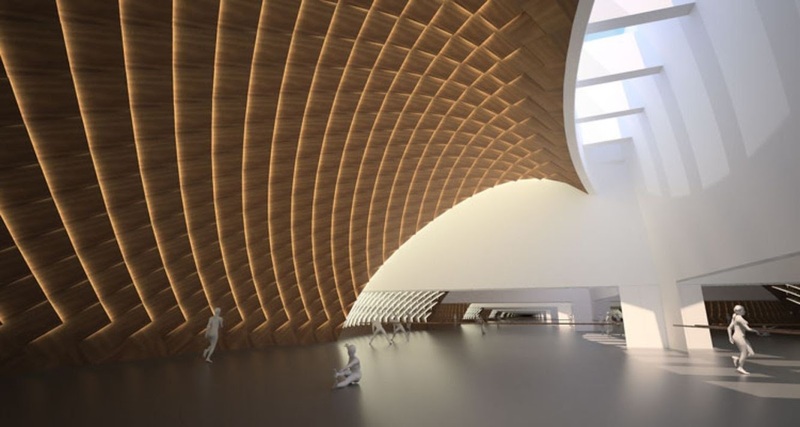 The interior space uses a large amount of wood to provide the best possible acoustical effects for the Performance Hall of the Grand Theater. Also, the wood and the white wall form a balanced contrast between warm and cold colors, resembling the unique warm atmosphere of mountain huts. 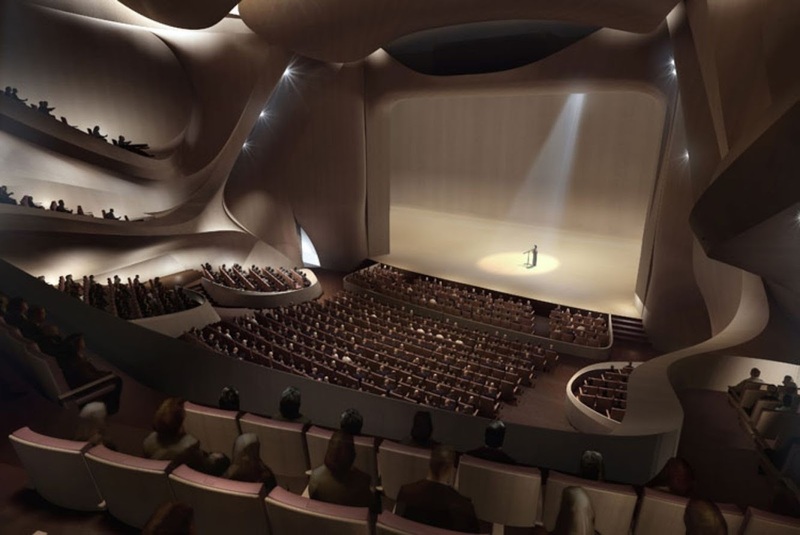 the stage design for the theater is not only suitable for western opera and modern drama performances, but also meets the requirement of traditional Chinese theater plays. the acoustics and lighting design provide a high level of performance for the various venues in the theater. Covered by curved acrylic lamps, the second floor Vip lounge appears as a glowing clear crystal floating in the theater. the standardized stage is equipped with a versatile orchestral pit, designed to meet large-scale performances of Opera, Ballet and other various needs. the 400 seat small theater that connects with the larger theater serves as the venue for small drama performances, chamber music, and operas. the design of the backstage curtain allows the stage to expand like a wide screen with natural landscape in the background integrating the indoor and outdoor view. 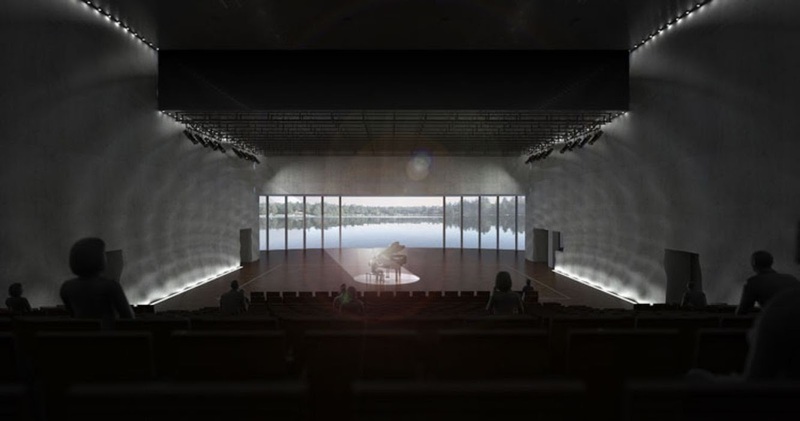 The outdoor water section can also be used as an outdoor auditorium, therefore when the curtain opens, it becomes a panoramic arena with unobstructed views. 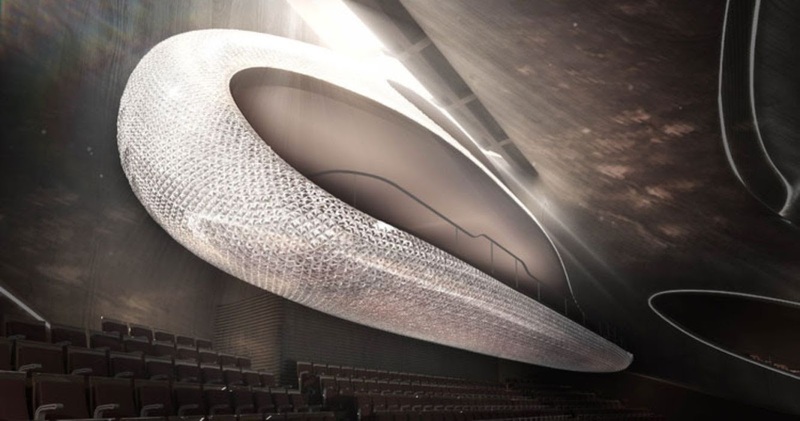 This ingenious design creates a great space and a delicate dramatic effect for the Grand Theater to adapt to the innovation and changes of the modern theater art. the art center demonstrates the rich scale of the city, the nature and the people. It encourages the publicity and mass participation of Harbin’s art and culture activities. People can get a different sensory experience from different distances. The huge man-made lake between the Grand Theater and the Culture and Art Center contrasts the building with a long landscape bridge wedged in-between to form a Buddhist concept of “Void”. Along the landscape bridge, visitors can reach the Labor Recreation Center west of the Great Square. With a construction area of 41,000 square meters, this building is a comprehensive building complementing the Grand Theater. Its functions include staff training, conferences, cultural education, exhibitions, hotel and catering space. 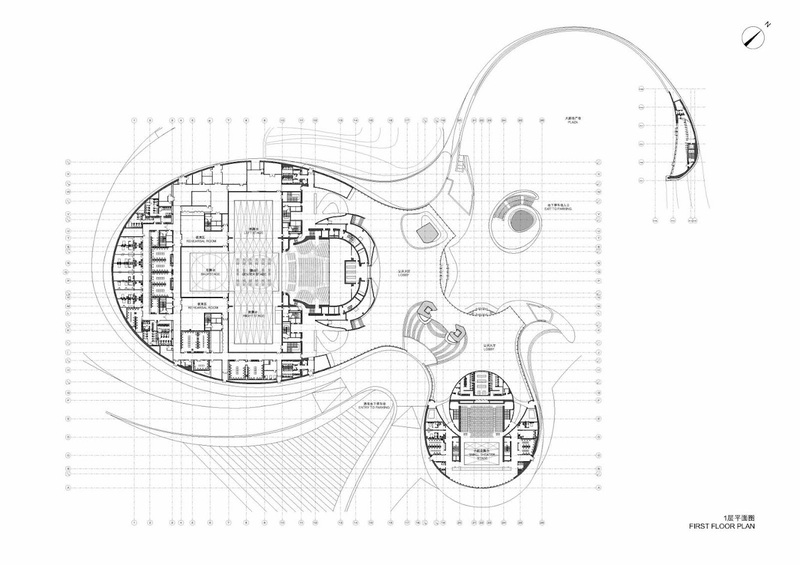 These facilities will provide a diversified space for visitors, spectators and the staff. 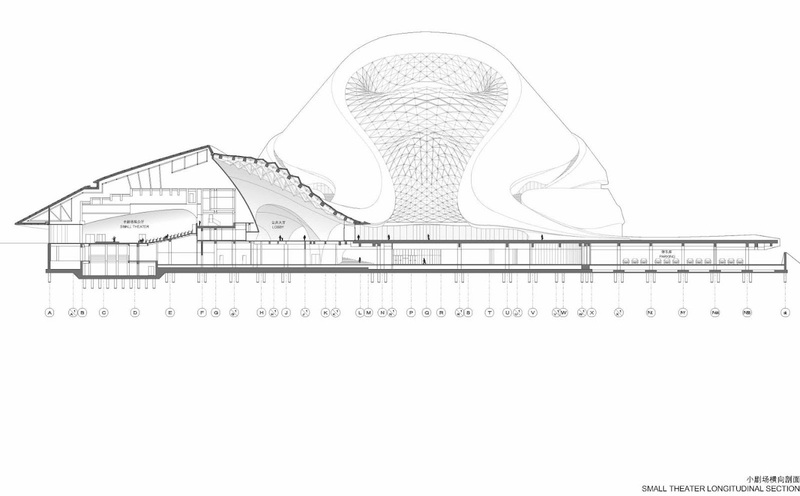 the boundary of the Cultural Center interconnects with the river bank and wetland, blurring the boundaries of the natural and the artificial. Open spaces like ramps, bridges, sky terrace and squares bridge the distance between man and nature. 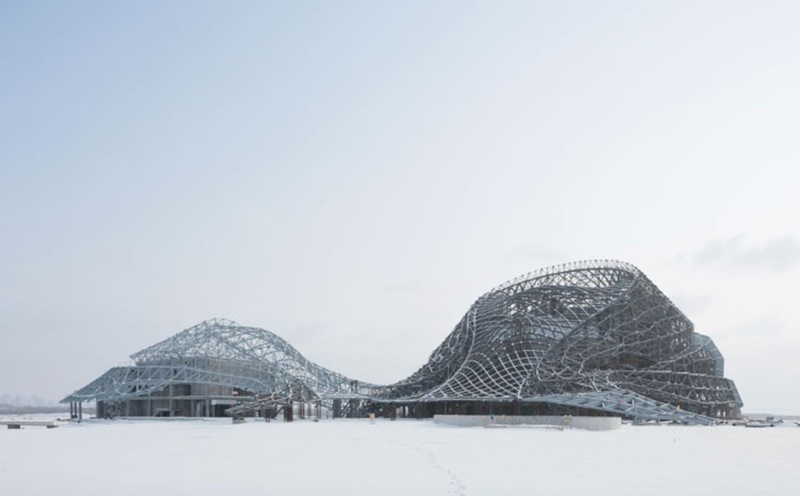 This new cultural island in Harbin is emerging to facilitate the blend of humanity, art and nature in the north and it will become the center of this city’s spirit.